U.S. taxpayers doled out more than $6.4 billion in subsidies to the commercial fishing industry between 1996 and 2004, possibly accelerating the ongoing collapse of fish stocks worldwide and adding to the devastation of large ocean fish species. U.S. subsidies, calculated for the first time by Renee Sharp, director of Environmental Working Group's California Office and renowned fisheries economist Ussif Rahid Sumaila, director of the Fisheries Centre at the University of British Columbia, amounted to 21 percent of the $31 billion U.S. commercial fish harvest between 1996 and 2004. Some kinds of subsidies can be good, if they encourage conservation and careful management of fishery stocks or if they equip under-employed fishers for other lines of work, for example. But there is general international consensus that some other kinds of subsidies can contribute significantly to the depletion of ocean fish. The Sharp-Sumaila study published in the North American Journal of Fisheries Management and supported by the Lenfest Ocean Program has determined that direct federal and state subsidies to commercial fishing operations totaled $6.4 billion and averaged $713 million annually (in 2007 dollars) between 1996 to 2004. There is ample evidence that the U.S. commercial fishing fleet has over-exploited marine fish stocks, in some cases to the danger point. 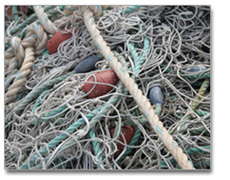 An April 2008 report entitled “Excess Harvesting Capacity in U.S. Fisheries” and published by the National Marine Fishery Service (NMFS) found that 12 of 25 U.S. commercial fishing operations it examined had 50 percent more boats than needed to bring in each operation’s total fish catch for the year (NMFS 2008a). Having too many boats is one component of overcapacity, which is a more complicated metric that relates to the amount of fish that all vessels in a fishery are able to catch. The logical result of overcapacity is overfishing, meaning, that more fish are harvested than can be naturally replaced. Reports on the current status of U.S. fish stocks are bleak. According to NMFS data, in 1997, 32 percent of the nation’s 269 monitored fish stocks were considered overfished, meaning seriously depleted (NMFS 1997). In 2007, a decade later, 24 percent of 190 monitored fish stocks were still categorized as overfished, and another 17 percent were deemed subject to overfishing (NMFS 2008b). The global situation is similar: In 2004, the last year for which subsidy data were available, the United Nation’s Food and Agriculture Organization estimated that the proportion of overexploited and depleted world fishery stocks approached 25 percent, up from 10 percent in the mid-1970s (FAO 2004). Although fishery management failures have long been recognized to play a key role in the growing problem of overfishing and overcapacity, more recently a consensus has emerged that government subsidies to the fishing industry are also an important contributor (FFITF 1999, UNEP 2004, USCOP 2004). As the Federal Fisheries Investment Task Force noted in a major report on U.S. fisheries subsidies in 1999 (FFITF 1999), "A number of studies in recent years have been issued... concerning subsidies and capacity in world fisheries. The consistent conclusion is that there is overcapacity worldwide, that government subsidies have contributed to this overcapacity, and that overcapacity has contributed to the decline of many marine fishery resources." Fishing subsidies also have significant environmental impacts that stretch beyond the sea. 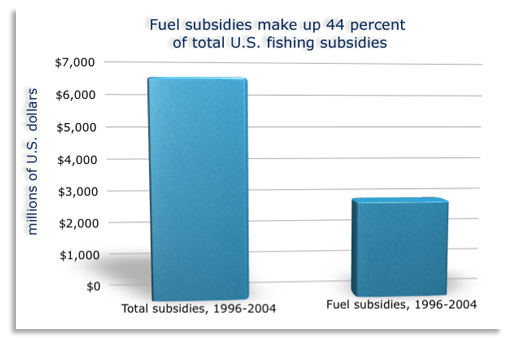 EWG’s calculations showed that fully 44 percent of federal and state subsidies between 1996 and 2004 went for fuel for fishing fleets. Supporting fuel costs has may not have only helped promote the needless expansion of commercial fishing operations, it has also likely caused wasteful fuel consumption, air and water pollution and greenhouse gas emissions that exacerbate global warming. Unlike motorists and truckers, commercial fishing operations are exempt from all federal and state fuel taxes and some state sales taxes on fuel. EWG found that these tax breaks were worth $2.8 billion to the fishing industry over the 1996-2004 period, or $314 million per year. The U.S. fishing industry is estimated to use about 800 million gallons of fuel each year. While not the only industry to receive hefty fuel subsidies, they nonetheless provide commercial fishing operations with less incentive to conserve. A 2008 World Bank report concluded that at the global level, each ton of fish caught uses almost half a ton of fuel, much of it wasted as too many boats chase too few fish (World Bank 2008). Moreover, the Organization for Economic Cooperation and Development (2006) recently concluded, in its major study on the implications of fisheries subsidies, that the environmental impacts of fuel tax exemptions are "potentially significant" (OECD 2006). While it is impossible to predict exactly what kind of effect a particular subsidy will have on a given fish stock, some subsidies are more likely to be harmful than others (OECD 2006). The worst are those that contribute to overfishing and/or overcapacity under virtually all circumstances. The best are those that contribute to conservation and appropriate levels of fishing capacity under virtually all circumstances. EWG calculated that from 1996 to 2004, the majority (56 percent) of government funds went to harmful subsidies, the largest being fuel subsidies and state sales tax exemptions. The rest, 44 percent, went to “ambiguous” subsidies, so termed because they could be beneficial, neutral or harmful, depending on the exact nature of the program. Funds for fisheries research, for example, are often -- but not always -- beneficial: EWG’s research found that at least some funds were being channeled to research into increased fisheries exploitation. Similarly, disaster aid programs can be designed to retrain out-of-work fishers for new jobs, or they can essentially support repeated “boom and bust” cycles of overfishing and fishery disasters. It is important to note that when most people think of subsidies, they may imagine direct payments to fishermen. While such types of subsidies do exist, they more often take other forms such tax exemptions or preferences, favorable loan rates, money to bolster demand for U.S. fish at home or abroad, fisheries research, or other such types of less commonly thought of types of subsidies. The Sharp-Sumaila study is the first to attempt a detailed accounting of individual U.S. fishing subsidy programs on both state and federal levels and is perhaps the most in-depth examination of fishing subsidies ever conducted for any country. Such a detailed examination can reap surprising results. Salmon and tuna fishermen together received more than half of the $70 million per year that could be linked to specific fish. Fishermen in Alaska and the Western Pacific area (Hawaii and American Samoa) were the main beneficiaries, pulling in 23 percent and 28 percent, respectively, of the roughly $200 million that could be traced to particular regions. More details on individual subsidy programs, breakdowns by geographical region, fish species, and federal vs. state money can be found in the peer-reviewed publication (Sharp 2009), and in additional databases available only on EWG's website. In all scientific endeavors with time and money constraints, increasing a study’s depth requires limiting its breadth to some degree. For this reason, EWG was forced to exclude from its analyses some indirect fishing subsidies. When the approximately $1.1 billion the U.S. spends yearly on fisheries management and services are considered, annual government support for U.S. commercial fisherman rises to $1.83 billion –- more than half the total value of the yearly catch. Subsidies of such magnitude have great potential to distort market forces, undermine voluntary conservation efforts and complicate international diplomatic and trade initiatives. These data, along with data from other similar studies, help explain why global stocks of fish are in dire straits. Right now, no one is winning. "Right now, no one is winning. The real income levels of fishers are depressed, much of the industry is unprofitable, fish stocks are depleted and other sectors of the economy foot the bill for an ailing fishing industry" (World Bank 2008). While the problem of fishing subsidies in the U.S. is significant, it is an even more serious problem in many other countries. Globally, fishing subsidies are estimated to total more than $30 billion per year. The U.S. has been in the forefront of efforts to limit harmful fishing subsidies through the World Trade Organization. In fact, as a part of the so-called Doha Round of global trade talks, the U.S. has pressed for strong WTO rules that could even require some of the subsidies identified in the Sharp-Sumaila study to be eliminated or re-programmed towards more sustainable uses, such as promoting the reduction of excess fishing capacity or the adoption of more selective fishing techniques. Unfortunately, the Doha talks have been repeatedly delayed by diplomatic disagreements over agricultural subsidies and industrial tariffs, and the timetable for completing the Round is still an open question. Even if a WTO agreement is eventually reached, it remains to be seen whether the new rules really take on the most dangerous forms of fisheries subsidies. Fuel subsidies, for example, are widely used, and are considered politically sensitive by many governments around the world. While the U.S. and other governments have pledged to eliminate subsidies that drive overfishing, it remains unclear whether they will really deliver WTO rules that do the job. It would be a critical oversight, for instance, if WTO rules do not eliminate or sharply reduce fuel subsidies, since cheap fuel not only contributes directly to overfishing but also undermines international efforts to slow global climate change. There are reasons to hope that at least the U.S. might be tackling the longstanding problems of overfishing and overcapacity. In December 2006, for example, the U.S. Congress enacted a set of ambitious amendments to the 1976 Magnuson-Stevens Fishery Conservation and Management Act, calling for an end to overfishing by 2011 and setting, among other measures, mandatory annual catch limits for species subject to overfishing. While these reforms do not address subsidies, and not enough time has passed to evaluate their effectiveness, they are nonetheless encouraging because they represent what is perhaps the strongest U.S. legislation ever enacted on the issue. Another reason for optimism is President Obama's nomination of Dr. Jane Lubchenco, a well-known marine fisheries biologist who has long advocated stricter conservation measures for the oceans and more aggressive action on climate change, to head the National Oceanic and Atmospheric Administration (NOAA), the agency responsible for managing the nation’s fisheries. In addition, while they still have a way to go, the U.S. has been one of the proactive countries in terms of addressing the issues of fishing subsidies. Not only has the U.S. been leaders in the WTO process, it was one of the first countries to start looking at their own fishing subsidies in 1999 when it appointed a Congressional task force to study the issue. The bottom line, however, is that as the oceans become more and more depleted it is becoming more critical to address subsidies - both in the U.S. and around the globe. Shift subsidies away from programs that encourage overfishing and overcapacity to those that are beneficial to the long-term health of commercial fishing and fisheries such as direct investments in conservation, retraining for out-of-work fishermen, increased data collection for data-poor fisheries, and the transition to management structures that allow fishermen to have an ownership stake in fisheries. Fuel subsidies, in particular, should be curtailed and the revenue used to fund the establishment and maintenance of marine reserves for the key commercial fisheries. Any subsidies designed to reduce capacity must be desgned to appropriately to ensure they do not have unintended consequences. Work towards successful completion of the WTO fisheries subsidies talks, including a global ban of harmful fishing subsidies such as fuel tax exemptions government support for for vessel construction and modernization. Such multilateral action is essential not only because trade pressures make it difficult for individual countries to reduce subsidies if others aren't, but because some species are wide-ranging and are fished by many different countries' fleets. Aggressively implement the 2006 Magnuson-Stevens reforms and ensure that the government's financial policies (including subsidies) are tightly linked to management plans. Fisheries cannot become or remain healthy over the long-term if subsidies are encouraging expansion of fishing fleets or days at sea. Work at home and abroad to make fisheries subsidies programs more transparent by requiring publication of details about subsidies and how they are used. Federal Fisheries Investment Task Force (FFITF). 1999. Report to Congress. National Oceanic and Atmospheric Administration. Available: www.nmfs.noaa.gov(March 2008). Food and Agriculture Organization of the United Nations (FAO). 2004. The state of the world’s fisheries and aquaculture. FAO, Rome. Available: www.fao.org(March 2008). National Marine Fishery Service (NMFS). 2008a. Excess Harvesting Capacity in U.S. Fisheries. Available: www.nmfs.noaa.gov/msa2007/docs/042808_312_b_6_report.pdf(January 2009). National Marine Fishery Service (NMFS). 2008b. National Marine Fishery Service 2007 report to Congress: The Status of US Fisheries. Available: www.nmfs.noaa.gov/sfa/domes_fish/StatusoFisheries/2007/2007StatusofUSFisheries_Report_to_Congress.pdf (February 2009). National Marine Fisheries Service (NMFS). 1997. National Marine Fishery Service report to Congress: Status of Fisheries in the United Sates. Available: www.nmfs.noaa.gov/sfa/Fstatus.html(February 2009). Organisation for Economic Cooperation and Development (OECD). 2006. Financial support to fisheries: implications for sustainable development. OECD, Paris. Available: www.oecd.org. (March 2008). Schmid, RE. 2006. Overfishing May Harm Seafood Population. Washington Post. November 3, 2006. Available: www.washingtonpost.com/wp-dyn/content/article/2006/11/03/AR2006110300217.html(February 2009). UNEP (United Nations Environment Program). 2004. Analyzing the resource impact of fisheries subsidies: matrix approach. Available: www.unep.ch/etb (March 2008). U.S. Commission on Ocean Policy. 2004. An ocean blueprint for the 21st century. U.S Commission on Ocean Policy, Final Report, Washington, DC. Available: www.oceancommission.gov (March 2008). World Trade Organization (WTO). 2008. New draft consolidated chair texts of the ad and scm agreements. TN/RL/W/236. WTO. Negotiating Group on Rules. December 19, 2008. Available: www.wto.org/english/tratop_e/rulesneg_e/rules_dec08_e.doc (February 2009). World Bank. 2008. The Sunken Billions. World Bank and FAO. Available: http://go.worldbank.org/EKE38PW3O0(January 2009). Worm, B, E Barbuer, N Beaumont, JE Duffy, C Folke, BS Halpern, JBC Jackosn, HK Lotze, F Micheli, SR Palumbi, E Sala, KA Selkoe, JJ Stachowicz, R Watson. 2006. Impacts of biodiversity loss on ocean ecosystem services. Science 314(5800): 787-790. Available: http://www.sciencemag.org/cgi/content/abstract/314/5800/787(February 2009).